In today’s technologically advanced society, almost everyone is able to access online portals for a variety of purposes. Education is one of them. For the past few years, we have seen an immense shift in the way students approach studies. Gone are the days when heavy books needed to be carried, and they were all painted in highlighter ink on almost every page. Smart studies have given way to a number of efficient and time-saving methods. Now that almost all kids are familiar with smartphones and computers, the same can become a helpful companion for their ever difficult and dreaded examinations. As such, here are five of the best apps on Android that can help students in obtaining great results for competitive examinations. Unacademy is a learning app unique to the feature that many decorated individuals actually take part in the development of its curriculum. With, over 8,000 tutorial lessons for various major competitive examinations, such as UPSC CSE/IAS, SSC, CGL, CLAT, JEE among many others. The league of Unacademy instructors stretch across all of India, so you can be sure of quality content on the app. Unacademy even has a Youtube channel for further references on tuition. No matter what exam you are preparing for, Unacademy is worth a try. Downloads – More than 1 million. Pros – Variety of content, Great quality of tuition development team. Cons – App is a bit sluggish on older phones, interactive experience not too great. Careers360.com has made a lot of confusion go away for higher studies opportunities that wriggle in the minds of every teenager. The app lets you do the same and then some. Along with information on almost every college across India, you can also find sample test and mock papers for competitive exams such as JEE, CAT, MAT, AIPMT, AILET, etc. that can help determine how well prepared a student actually is. It also contains various portals for predicting best colleges and has a database of more than 1000 eBooks to stay updated on the curriculum. It also offers insight into many institutions based on actual reviews submitted by their alumni. In addition to all this, the app contains no purchases. Pros – Widest variety of subject papers and mock tests for medical, engineering, law, arts, etc., ability to compare colleges and courses, 24/7 counseling help available, no in-app purchases. Cons – Users have reported several bugs and crashes, the interface is smooth but cumbersome at times. Gradeup is a relatively new app on Android that helps prospective candidates prepare for a wide range of exams such as JEE, CAT, CTET, IBPS, PO, SBI, UPSC, GATE among many others. Much like a set of Quantum books, gradeup enables you to possess valuable notes and sample papers to prepare best for the exam and focus on important sections of the syllabus. Moreover, the content is available in both Hindi and English, with regional languages being updated soon. Pros – Multilingual content, easy to use, less than 6 MB of downloads, notes can be made available offline, progress tracking of a candidate. Cons – Lack of efficient live counseling, a density of sample papers is less as compared to other services. Oliveboard is an e-learning app that can help candidates prepare for Banking and Government examinations. It has a huge collection of lectures and tutorials covering exams such as RBI, SBI, IBPS, UPSC CSE, Railways among numerous others. There are topic tests for various topics that the candidates feel they should improve upon. What’s more is that there are zero in-app purchases and all the content, including lectures, are made available to students absolutely free of cost. There is even a database for interview questions so that the chances of the selection of a candidate are increased considerably. Pros – A large database of mock tests and sample papers for bank and government exams, easy to use, very few crashes, works even on older phones. Cons – No content for engineering or medical examinations, an absence of counseling and effective one-to-one expert sessions. It is fair to say we saved the best for last. BYJU’s is an app that you can download for your kid in class 6th and the same app can help him/her right up to the moment they join their dream colleges. The app has the largest collection of notes and mock tests, including sample papers for CBSE and ICSE examinations. What BYJU’s does best provides a stable and strong base for the students of tomorrow, and strengthen the base for CAT, JEE, UPSC and AIPMT aspirants. Each student upon registration gets their own mentor who monitors their progress throughout the year. The adaptive learning modules help students learn their own way and at their own pace. Pros – Award-winning e-learning system, interactive sessions with mentors, largest database of syllabi, adaptive learning different for each student, interesting teaching experience through a variety of visual exercises. Cons – The app is not fully optimized for older devices, lack of offline content, reports of serious crashes occurring mid-session. I hope you like the article. 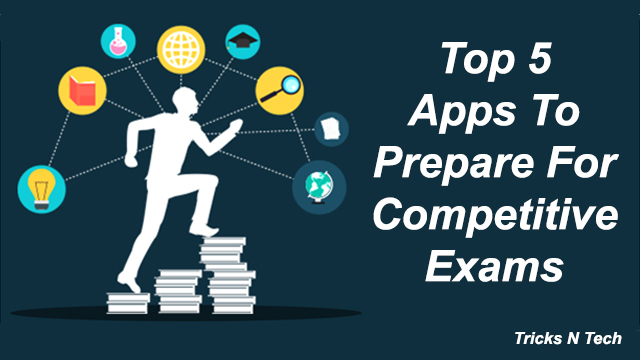 If you know any other apps to prepare for competitive exams then let us know in the comment section. If we liked it then will add it in our article for our readers. Apply for Sarkari Result after Competitive Exams. Thanks for sharing such useful information. It is helping me a lot in my studies.